Although the cometary globule CG4 (also called "God's Hand") looks menacing, it’s actually being ripped apart by nearby stars. A telescope in Chile has captured a stunning view of a cosmic object with the celestial nickname "God's Hand." 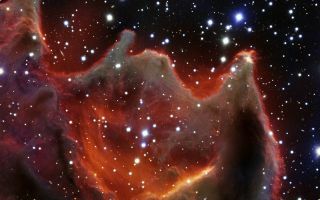 The cometary globule CG4 glows threateningly in the image taken by the European Southern Observatory's Very Large Telescope (VLT) in Chile. It's easy to see why CG4 is referred to as God's Hand. The cometary globule appears as though it's about to devour distant stars and even space itself. But in reality, this tortured nebula of gas and dust is gradually being destroyed by nearby stars. ESO scientists used telescope observations to create a stunning video flythrough of the God's Hand cometary globule. The head of CG4, which is only partially visible in the new VLT photo, is roughly 1.5 light-years long. The tail, which extends below the image, is about 8 light-years long. Although the head alone is over 2,000 times larger than our solar system, it’s relatively small astronomically speaking. In fact, it only harbors enough material to make a few sun-size stars. The frightening head of the nebula is a thick cloud of dust and gas, which is only visible because it's illuminated by nearby stars. GC4 glows brilliantly in red light from electrically charged hydrogen. Astronomers know this particular light well. It's the H-alpha spectral line, which occurs when a hydrogen electron falls from its third to second lowest energy level. The nearby stars are continually ionizing the cometary globule's gas. But it doesn't take long before the nucleus and removed electron can recombine to form a new hydrogen atom with the electron typically in a higher energy state. This electron will then cascade back to the ground state, a process that produces H-alpha emission – or red light – about half the time. This very process, however, is also gradually destroying the head of the globule by eroding away tiny particles that scatter starlight. But the reason behind CG4's and other cometary globule's ruptured form is still under debate. One theory suggests that they were originally spherical nebulas, which were ruptured by a nearby supernova explosion. Another theory suggests that they were shaped by nearby stellar winds and ionizing radiation from hot nearby stars. Astronomers will have to further study these cracked clouds in detail. By determining the mass, density, temperature, and velocities of the visible dust and gas, astronomers can shed light on their violent origins.